baybee in the shoebox! – Hello Korea ! Thursday night my friend let me know that the kittens were healthy and available! OMG I’m not prepared! So that night I set out and spent the evening trying to figure out the very best way to kitten-proof the house, which was no small task, what with hair bands, art supplies, etc. : my house was an extremely hazardous place! So had to totally re-arrange EVERYTHING, especially the veranda where she would be spending the day while I was at work. And then I realized I needed a place to put the art supplies, so the following day I had to travel to Chuncheon to see if there were pet stores and to get a small chest of drawers. Fortunately, Chungmuro pet street opens at 9:30 a.m., so I was able to run to Soul and find everything I needed. Let me tell you, carrying kitty litter, kitten food, a scratching post, toys, and a pet carrier is no small task. OF COURSE when I met my friend and we got to the shelter, it turned out to be a pet store with everything I needed, but cheaper! It’s this great chain called Pet Club and they have resident animal clinics. And there are no pets on display for sale, the vet there just works through the public pound listings and with foster parents to help try and save some from death on the street or death through the pound. So we’re thinking that many of the pets listed on the public pound pages are also assisted through veterinarians in this way. 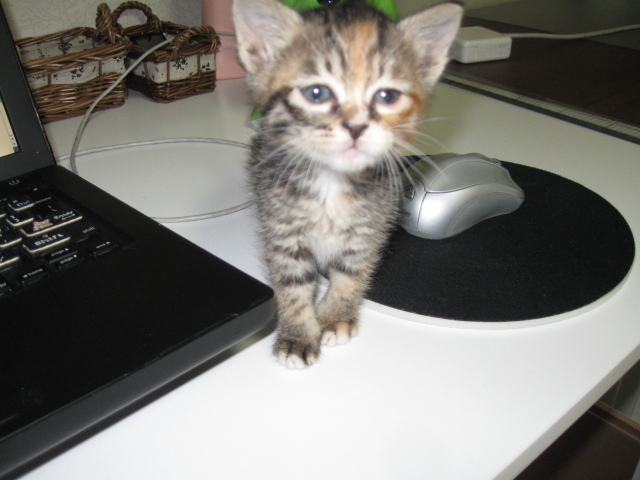 This little one is just 2 months old and weighs a half kilo (just over one pound). Bonding was instantaneous, as she was nothing but purrs the minute I took her out of the carrier after we arrived home. I worry about socializing her, since I don’t have a lot of visitors and it would be inappropriate to take her to school, but hopefully I can take her out on walks a lot and maybe she’ll let others pet her. She’s barely been weaned, so she spends a lot of time rooting and sucking still. Her meals are about a tablespoon of food, 3 times a day, and so I will have to come home at lunch to feed her. She thinks fingers are teets and if she was more powerful, my neck would have a ring of tiny kitten hickies all over it! She’s also extremely vocal and wants constant attention, making it near impossible to get anything done, such as typing on the computer. I recently remembered I had a scarf/sarong from Thailand (used as a halter top in their traditional dress) that’s about 6 feet long, so I fashioned a sling out of it and voila! Hands free! She likes it a lot – it reminds me of the kids when they were babies, of course, since they were always strapped to my chest too. But after about a half hour she’s done and wants to get out. I couldn’t afford nor could I carry a kitty bed (and they were all too big anyway), so I’ve turned her carrying bag on its side, put a towel in it, and taken my baby neck rolls to pad and prop up the sides. Perfect! It’s cozy, comfortable, smells like me, and will get her not afraid of the carrying case for those times when I really need to pack her along. She didn’t evacuate forever and I was getting worried there was a problem, but today she used the cat box without prompting. Thank God for instinct, as I’ve not one mess to have ever cleaned up. The cat box is actually the tray to a Korean colander. They are platter-shaped, and under-neath is a tray to catch water. It’s the perfect mini litter box. t.g. said that “nabi,” “naero,” and “ya-ong” are the most common cat names in korea. Oh! I wonder what “naero,” and “ya-ong” means? The winner of the name wonami’s kitten gets pat binsu, and thus far I’ve only got “nabi” as a contribution. But, there’s still 2 weeks of the contest left. She also knows where her food and box is, so I don’t think I need to close her off like the vet suggested – however, I might do it just so she’s forced to use the pet carrier as a bed. She also wants to eat a lot more than the vet gave her. Ok. Enough crazy cat lady talk. America’s top model is on! (missed the latest episode this week) Gotta run! Haven’t commented in a loooooong time but just had to say grats on the new kitten. So cute!